Valentin (James Patrick Stuart) came to Nina’s (Michelle Stafford) office at Crimson. They both received their copies of the divorce papers which he urged her not to sign. Nina told Valentin that the thing with Peter (Wes Ramsey), Charlotte (Scarlett Fernandez) and her own baby has made her feel the way she does. Nina signed the divorce papers as Cassadine received a text from Curtis. Curtis (Donnell Turner) waited at General Hospital for the DNA test results. Mike (Max Gail) and Carly (Laura Wright) were waiting for Jason (Steve Burton) at The Floating Rib, but he was at the PCPD with Diane’s (Carolyn Hennesey) associate Henry. Jason told Henry he must shut the D.A. down. Ryan (Jon Lindstrom) was frustrated when Lucy (Lynn Herring) kept insisting he was sick and wanted to nurse him back to health. Carly assured Mike that Jason would be fine talking with the police because Morgan never says anything when questioned. Henry accuses D.A. Margaux Dawson (Elizabeth Hendrickson) of reaching as she insists Sonny (Maurice Benard) shot her father and Mike is covering up for him. Realizing there was no way of getting rid of her “Kevin” told Lucy she could come over to his place to help nurse him back to health. At Crimson, Nina wonder whether she should have stayed married to Valentin in order to be close to Charlotte. Lulu told Nina that as much as she didn’t trust Valentin, she knew he wanted what was best for Charlotte. The D.A. test prove 99.9% Sasha Gilmore was Nina’s daughter. But Valentin wanted to wait until they received the second test results before telling Nina. Margaux asked Jason how he’d feel if someone did to Sam (Kelly Monaco) and his kids what they did to she and her mother; kill him and bury his body for thirty years…wouldn’t he want revenge? Before he and Jason left, Henry warned Commissioner Ashford (Briana Henry) to find a D.A. who would follow procedure or she’ll open up the department to a lawsuit. When Carly heard Ryan tapping out ‘Help Me’ in morse code, she questioned him about her neighbor at Ferncliff. Valentin finally agreed with Curtis to tell Nina her daughter was alive but didn’t want Sasha to know yet. Jordan urged Margaux to recuse herself from the case, but Margaux vowed to bring her father’s killer to justice regardless of what it took. When Jason arrived at The Floating Rib, Mike assured him no one would ever find the gun because he remembered dropping it in the Hudson River. Valentin returned to Nina’s office and told her he wanted to talk about her child. As Ryan pulled out a telephone cord which he planned to use to strangle an annoying Lucy, he was surprised by a knock on the door. It was Laura (Genie Francis). Carly (Laura Wright) and Jason (Steve Burton) discussed Mike’s (Max Gail) confession that he threw the gun into the river to protect Sonny (Maurice Benard). Margaux (Elizabeth Hendrickson) told Jordan (Briana Henry) she could get to Sonny through his right hand man. Kim (Tamara Braun), Drew (Billy Miller) and Oscar (Garren Stitt) had a meeting with Dr. Randolph (Cassandra James) about a clinical trial Oscar is eligible for a slot in. But Oscar was still angry with his parents for keeping the truth about his cancer from him and sarcastically says that a clinical trial may be too late for him. Chase (Josh Swickward) thanked Lulu (Emme Rylan) for having him over for Sunday dinner. Lulu told him he was Dante’s partner so she had to look out for him. Valerie (Brytni Sarpy) was looking for the Commissioner because Jordan asked to see her. Oscar told his parents he would be the one to tell people about his cancer on his own terms. Valentin (James Patrick Stuart) came to Nina’s (Michelle Stafford) office and told her that when he visited Madeline (Donna Reeves) in jail she confessed while in her coma, Nina gave birth to a daughter. He explained further that Madeline didn’t want the child to have claim to Nina’s inheritance so she arranged for a private adoption. Valentin told Nina that Curtis found her daughter who’s name is Sasha Gilmore. Jordan told Valerie she passed her detective’s exam with flying colors. But Lulu wasn’t happy that Chase was her cousin’s temporary new partner and Valerie was given Dante’s desk until Jordan could find her one. Ryan (Jon Lindstrom) was shocked with Laura (Genie Francis) returned home. Laura didn’t like when Lucy (Lynn Herring) showed up at their door with chicken soup for Laura’s husband. Mrs. Collins wanted to make sure Ms. Coe knew the boundaries of remaining friends with Kevin. Laura reminded Lucy that the next time she wanted to bring over chicken soup, she should check out Scott (Kin Shriner). Oscar came to Sonny’s house and told a confused Josslyn (Eden McCoy) they needed to break up because he needed space. After Ms. Coe left, “Kevin” told Laura that for the last few weeks Lucy has been asserting himself into his life. He nixed sleeping with Laura lying he may be coming down with the flu and although he desperately wanted to make love with his wife, he didn’t want her to get sick. Nina wanted to wait for the second test results before making any decisions. 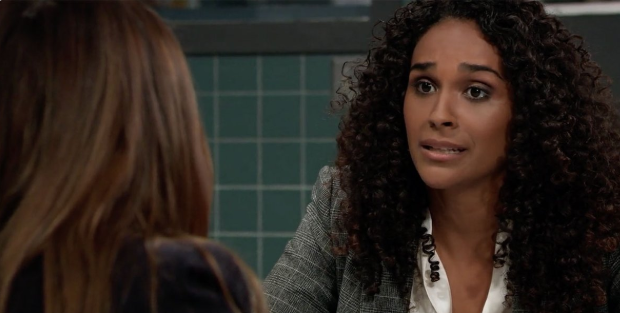 Carly reasoned if Margaux thought her father was dirty, she may back off the case against Sonny. Meanwhile, Margaux thought about Drew having Jason’s memories. Josslyn (Eden McCoy) told her mother she wasn’t going to school then cried in Carly’s (Laura Wright) arms that Oscar (Garren Sitt) dumped her last night. Cameron (Will Lipton) struggled to write his English paper on Catcher in the Rye when Oscar approached him in the school library and gave Cameron his paper to use. Drew (Billy Miller) and Kim (Tamara Braun) talked about Oscar deciding to go to school even after all he’s going through. They met with Monica and told Dr. Quartermaine about Oscar’s cancer and the clinical trial Dr. Randolph recommended. Nina (Micheele Stafford) was preoccupied thinking about her daughter when Maxie (Kirsten Storms) entered her office to tell her about the WSB’s lead on Liesl (Kathleen Gati). When Curtis (Donnell Turner) arrived, Maxie thought Nina had hired him to find Liesl before the WSB. After Ms. Jones left the office, Nina questioned Curtis about finding her daughter. Laura (Genie Francis) wanted to spend the day with her husband but “Kevin” (Jon Lindstrom) told her he’s going to the hospital to treat his patients. Laura gave him a framed photo of the two of them together in Paris and asked him to wear the blue tie she bought him for his birthday. Oscar told Cameron that everyone but him knew he had cancer. Cameron was surprised Oscar wasn’t telling Josslyn the truth. Carly urged her daughter not to be down on herself because of the breakup with Oscar and agreed Josslyn could stay home from school because she didn’t want to see Oscar yet. As Ryan planned to strangle Laura with the blue tie, Lulu’s (Emme Rylan) arrival stopped him. Monica reminded Drew she was a cancer survivor and they’d make sure Oscar was too. Carly came to General Hospital and asked “Kevin” for a therapy session so she could work through her time in Ferncliff. Carly told Kim that Oscar broke up with Josslyn. Kim couldn’t tell Carly the reason why. Felicia came to the Crimson office and suggested a mother/daughter trip for she and Maxie to get her daughter away from the Ryan Chamberlain murder hoopla. Curtis filled Nina in on her search for Sasha. He received a call that the second test results were in. They proved for certainty Sasha was her daughter. Cameron came to see Josslyn and learned Oscar broke up with her. She wondered whether it was because he found another girl. Feeling he doesn’t have a future, Oscar told Drew he intended to drop out of school. Josslyn asked Cameron to help her get Oscar back. Nina told Maxie that Curtis found her (Nina) daughter. Lulu and Laura caught up. Lulu told her mother about the articles she did on Nathan and Faison’s son who turned out to be Peter August. Lulu commented how Kevin has been providing insight for her piece on the Ryan Chamberlain Murders, giving a viewpoint that only someone who had been there could. Felicia arrived at GH. Ryan assured he always had time for her. Ava (Maura West) came to pick up Avery. Carly (Laura Wright) told her Avery was unavailable because she was in a meeting, meaning she was having a tea party with Mike (Max Gail). When Jason (Steve Burton) offered to throw Ms. Jerome out, Ava reminded Morgan that if weren’t for her he’d still be trapped in Russia. Jason said his debt to her was paid as he gave her the formula used to restore her face. He added that Morgan was his godson and after what she did to him, they’d never be even. Carly told Jason he didn’t have to walk Ava to her car. After Jason left the room, Carly taunted Ava about Griffin sleeping with Kiki (Hayley Erin). Peter (Wes Ramsey) found Griffin (Matt Cohen) at the gym. They talked about Dr. Munro being suspended because of the illegal DNA test he performed on him (Peter). August assured he wasn’t the one who told. Then, Peter offered Griffin a job as a medical editor at The Invader. Although he appreciated the generous offer, Griffin turned him down. Then, he asked Peter whether August has found peace after all he’s done. Nina (Michelle Stafford) told Maxie (Kirsten Storms) how Curtis (Donnell Turner) found her daughter Sasha Gilmore. With Chase (Josh Swickward) present in the exam room, Finn (Michael Easton) ran tests on their father and told George (James Read) once they had the test results back, they’d know what he was dealing with. Carly told Ava she couldn’t see Avery tomorrow because the little girl would be with her family to acknowledge the anniversary of Morgan’s death. And one day Sonny (Maurice Benard) would have to explain to her how Ava with held Morgan’s medication and was responsible for Morgan’s death. Felicia (Kristina Wagner) suggested she and “Kevin” issue to a joint press release to end Ryan’s reign of terror once and for all. Ryan agreed to the press release and suggested he and Felicia have a meeting to discuss it further. After Felicia left, Ryan had a session with Ava who told “Dr. Collins” how she tried to be a decent person but all she cares about now is wanting revenge. Ava told “Kevin” she’d like to see him again. Ryan told her to have his assistant set up a regular appointment so they could explore the concepts of revenge and satisfaction together. George hoped that now that Finn had found someone and moved on after the death of his wife, he’d wished Finn would forgive him for doing the same. When Nina asked what he thought about a friend of hers trying to make contact with the now grown daughter she didn’t know she had, Peter said that it was up to the girl to decide whether she wanted to get to know her mother but she’d appreciate the attempt. Kiki and Griffin shared a kiss. Danny showed Jason the project he did on different types of family, then asked him if he loved his mommy. Franco (Roger Hogwarth) brought Aiden to General Hospital. The little boy complained he was sick and Franco picked him up from school. But when Elizabeth felt his forehead, Aiden didn’t have a fever. Cameron (Will Lipton) came over to the Corinthos house where Josslyn (Eden McCoy) asked him to help her get Oscar (Garren Stitt) back. She was certain breakup was just temporary. Oscar told Kim (Tamara Braun) and Drew (Billy Miller) he was dropping out of school; since he had cancer what was the point of wasting time in school when he didn’t have a future? Danny asked his father whether he loved mommy and Jason (Steve Burton) answered yes. Jason agreed to put together Danny’s project while he stayed over Grandma Monica’s (Leslie Charleston). Maxie (Kirsten Storms) asked Peter (Wes Ramsey) why he was avoiding her. She knew Lulu (Emme Rylan) told him to but she didn’t knew why he was listening to her (Lulu). Peter explained that he knew he’d hurt her and thought it better to keep his distance. Maxie asked Peter what if she didn’t want to keep his distance; she realized it was easier to forgive than hold on to anger. Josslyn’s plan was to give Oscar an anniversary do-over and asked for Cameron’s help in decorating theirs (her and Oscar) bench. Oscar reminded his parents that having hope wouldn’t guarantee a cure. Maxie told Peter how hurt she was when she found out he was Henrik Faison and lied to her for months, she felt incrediably angry until she remembered how nice and supportive he was to her; he helped her give birth to James. And after all the bad things she’d done, forgiving him was her way of paying it forward. Josslyn asked Cameron to text Oscar. Meanwhile, Oscar told his parents he was up all night researching online searching for anything to have hope. Maxie asked Peter whether there was another reason for his PTSD besides Liesl (Kathleen Gati) holding him hostage. Josslyn reminded Cameron you don’t love someone one day and break up with them the next. Oscar told his parents he broke up with Josslyn because he didn’t want her wasting her time trying to find a cure for him. Peter told Maxie a story how when he was seven and couldn’t swim, his father threw him in the deep end of the pool and he sank and blacked out. Working on Danny’s Lego project reminded Sam and Jason how well their collaboration always worked. Kiki and Griffin decided to give romance a chance and made a date. Aiden told his mother he didn’t need his homework because he might be sick again tomorrow. Josslyn was shocked when Oscar blocked her from posting to his My Face page and updated his status to single. Oscar wanted Josslyn hate him so she won’t miss him when he’s gone. Maxie offered to ride up in the elevator with Peter to help him conquer his PTSD. Sam and Jason kissed. The Week In Review recap I wrote for General Hospital for The Nerdy Girl Express.